So how are we to worship? Wow was he mad — furious, livid, scorched, choose your favorite term — at God. *1 David had wanted to bring home the Ark of the Covenant, the ark of God, the place the Name of God dwelled above the mercy seat and between the cherubim. David's motives were pure. He wanted to honor The LORD and bring God's blessing to his people. It was time to bring the Ark home. It was a day for God's people to rejoice. Around and in front of the Ark were people who were holy and had great zeal for God. David and all of Israel were celebrating and worshiping God with all their might as the Ark made its way home on a new cart. Castanets, harps, lyres, timbrels, sistrums, and cymbals sounded out the joyous melodies of praise and celebration as the Ark made its way home. Then the unthinkable happened: the oxen stumbled... the cart shuddered... and Uzzah reached out and took hold of the Ark. God's anger burned against Uzzah for his irreverent act. God struck Uzzah down and he died right beside the Ark. David had a heart for God. The Psalms testify to his adoration and dependence upon The LORD. David's rich vocabulary of praise still reaches out and gives us words to honor The Almighty, today. But in this moment, David's emotions toward the Lord were anger and fear — not holy fear or reverence, but terror. What began with great anticipation ended in death, embarrassment, anger and fear. When I share this story with most people today, the vast majority have a hard time with God about this. "Wasn't Uzzah trying to help?" "I can't understand how a loving God could do this!" I once heard a devout Jewish Christian say, "Most Western Christians wonder how a gracious God could strike Uzzah dead. Most of us who are Jewish Christians are thankful that God in his grace didn't strike down everyone in the crowd that day." Obedience. Not a popular word. But, if we look deeply at the mess of our world and its slide into the harsh grip of immorality, violence, genocide, crudity, disrespect for life, and hatred, we have to admit that our way of doing things doesn't work. Never has. There is something missing that we lack. Something only someone from a divine perspective can bring — the Someone who is bigger than our messes. Most of us don't want to admit this inability and failure on our part. In fact, most don't want to analyze the mess our world is in. Many still believe that the right leaders and the right politics and giving everyone freedom and democracy will make things okay. Yet no matter how good and needed many of these things are, the reality is, they do not and cannot make what is broken become unbroken. We trust our good intentions will pull us through and win the day. And so did David! We are all wrong. God is holy. God is holy and without him we are not. God is holy and sees things from a divine perspective. So God has things he asks us to do — things we need to obey. David and his contemporaries lost sight of that. David and the people he chose to help on this day treated the Ark of God like their neighboring nations had done in their ignorance (1 Samuel 6:7-8). But, David and those around him were God's people — called to a higher standard and a holy relationship with the LORD God Almighty among them. God had very clear instructions on how the Ark was to be handled with reverence and holy respect (Exodus 25:10-22; Numbers 4:1-16). David and the people had violated the commands of God. Uzzah, and those who witnessed his death, were reminded once again of the importance of obeying God and treating as holy what God deems holy. The story, thankfully, doesn't end with David sending the Ark away. Instead, after seeing the blessing that the Ark brings (2 Samuel 6:12), David reassembled the people and brought the Ark of God home. *2 This time the celebration was joyous and God was obeyed. In fact, David was so enthusiastic in his praise to God, that he worshiped in a way that some felt was undignified, especially for the King. David took off his royal clothes and stripped down to his simple linen undergarment robe and danced with all his might in worship to The LORD while all the people celebrated with him. God was passionately and extravagantly worshiped that day. All the people involved were given food from the offerings to take home and share with their families to celebrate the return of God's presence in the Ark to its home. However, when David arrived home, his wife Michal, the daughter of former King Saul, criticized him for being undignified in his worship. Anything less is to walk the path of David and Uzzah and miss the blessing of the LORD. David was unrelenting in the way he offered his joyous praise to God. David reminded Michal that God had appointed him King in place of her dad — not because David knew how to act like royalty, but because David was willing to become "undignified" and even "humiliated" if it brought about God praise and honor. God made sure that David's point of view was accepted and proved right and in the process we are reminded that we are called to love and worship God with all that we are — heart, soul, mind and strength (Mark 12:29-30) — and to offer ourselves as living sacrifices (Romans 12:1-2) and holy places where God dwells (1 Corinthians 6:19-20). So what are we to make of this story from so long ago that seems at first so foreign to our time and our worship? If we listen, we will hear needed reminders that our worship cart often falls in the ditch of either over-exuberant praise that forgets to obey the commands of God or gets so caught up in fear and a presumed sense of dignity that it forgets that worship must involve heart-felt and physically-expressed exuberance. 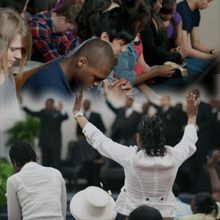 Yet a time is coming and has now come when the true worshipers will worship the Father in the Spirit and in truth, for they are the kind of worshipers the Father seeks. God is spirit, and his worshipers must worship in the Spirit and in truth (John 4:23-24). We want to obey and worship God with the reverence he has commanded us to give him. *3 We also want to worship God with unrestrained exuberance and heartfelt joy. Not only are both possible, both are necessary. So let's get our ox cart out of whichever ditch we're in, let's quit criticizing our religious friends who are in the other ditch, and let's bring the presence of God home to his people with worship that is genuine and obedient. Anything less is to walk the path of David and Uzzah and miss the blessing of the LORD. *1 See 2 Samuel 6:1-11. *2 See 2 Samuel 6:12-23. *3 Any close look at Exodus, Leviticus, and Deuteronomy reveals that when God wants things clear about how to worship, he is very specific about what he wants and doesn't want. Amazingly, there is very little in the New Testament about how we are to worship, especially when compared to the specificity of the Old Testament commands. One thing, however, is clear: our worship words and our lives must be congruent, consistent, and real. We must walk our talk and put into practice the character of the God we praise. "Getting Our Worship Cart out of the Ditch" by Phil Ware is licensed under a Creative Commons License. Heartlight encourages you to share this material with others in church bulletins, personal emails, and other non-commercial uses. Please see our Usage Guidelines for more information.